Well rewind to Saturday morning, when I went to visit the “other Gaye” A.K.A Susan the owner of Knit-A-Bit. She recently moved to a new location in Fanwood NJ and I have been meaning to visit. We get there and we look around, now let me say this: I had NO money to spend, well I had some but, I didn’t need to be buying anything. We walked around and got the lay of the land and said our hellos and gave out hugs. You know the normal stuff you do when you go to one of your favorite yarn stores. I go outside to take a picture of the front of the store and when I walk back in I notice a table that has yarn and magazine and …….Oh My!! what is this? 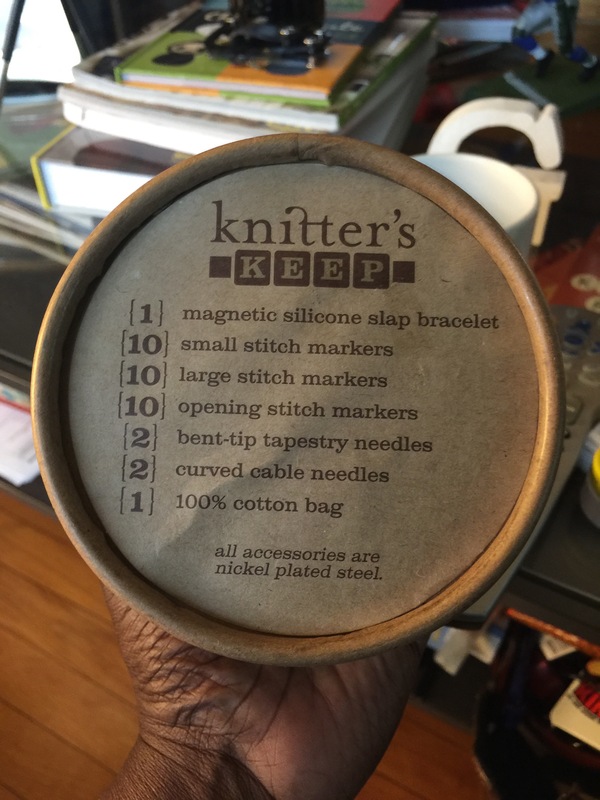 There just waiting for me to touch it and put it on was the one and only Knitter’s Keep. Now I don’t know about you, but I had seen pics of this all over Instagram and Facebook so naturally I was intrigued. The good part was Susan had a sample one that you could touch and feel and try on and fall in love with, yup all of that happened. 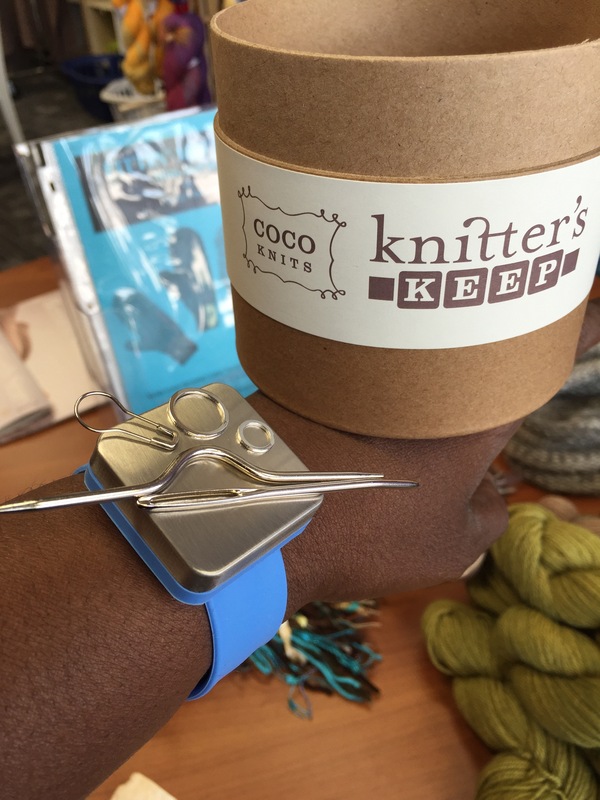 The clever accessory comes from CocoKnits. Remember the stone tape measures I fell in love with? This comes from the same company, yea I think I like them. A LOT!! LOL! 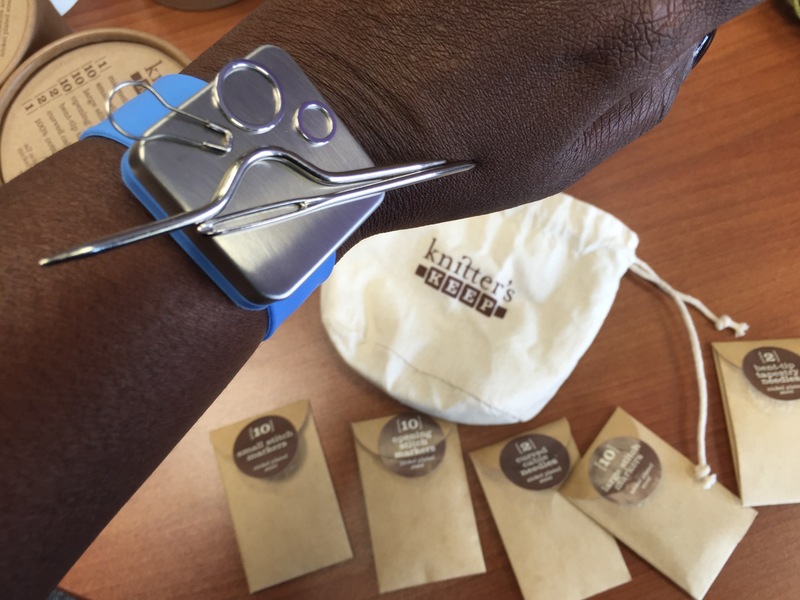 Now outside of the bracelet most knitters have all of these notions already, so why get this? Well first because it’s super cool!! AND I know I am not the only one that can’t find the tapestry needle when I need it or loses my stitch markers and have to stop knitting to find them. 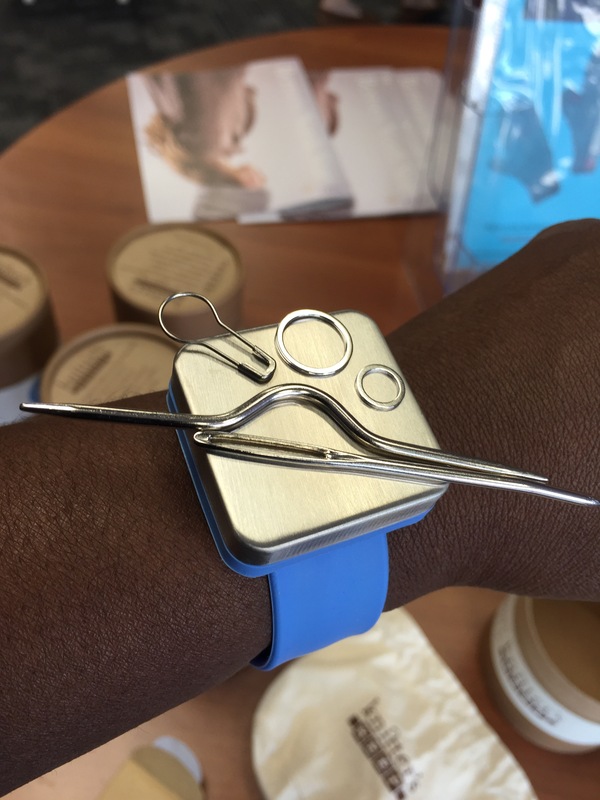 Please know the thought of them being on my wrist and not moving until I move them just gave me joy! I couldn’t leave it there, I mean I didn’t want it to cry when I left or something. Besides we bonded for like an hour, so we were in a relationship at that point. So yea, I had to have it, period. I won’t tell you that I walked around the store with it on my arm for over an hour. It is lightweight, it didn’t make me sweat AND my notions didn’t move!! I was not catering to it either, I simply went about my business of fondling all the lovely yarn and it didn’t budge. Oh yeah I had to have it, I mean food is over rated and I am fat so I can miss a meal or two. I mean all is fare in love and yarn, right? RIGHT! All of the notions are nickel plated steel and just look so good on my arm. Are you reading this and saying “GG, did you get this because you NEEDED it or just wanted it?” Well, why is that important? hahahahahahahahaaa of course I didn’t NEED it but I absolutely WANTED it and so it is mine. Ah so clever. Why don’t I ever think of these things?!? Well I can skip a meal..but yea I do need to do that! Yes girl, the worst that can happen is they say no or they say yes and you get free goodies!!! My lys needs to stock this magical box! This looks awesome! Yes tell them they must! I brought one today and loved it cause of your review. Enjoy! Because I love mine!! You totally cracked me up! Thanks for the laugh…..